Something special has come to live at my place. Her shiny surfaces gleam; gold decals, glint. She smells pleasingly of machine oil. Her body is heavy and cool to touch. She is functional, beautiful and has great sentimental value. I remember her from my childhood; and my mother from hers. 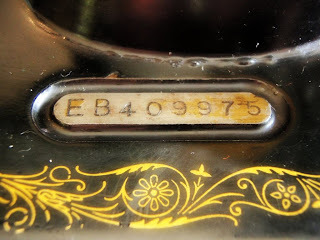 Her serial number - EB409975 - reveals she was manufactured in 1937 at Singer's Killbowie factory in Clydebank, Scotland. The hand-written note from my mum to me explains she was a gift from my grandad to my nan in 1938. The simple lockstitch functionality belies her history. 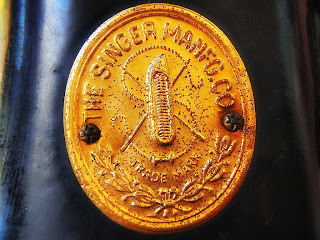 My nan - who was a wonderful seamstress - used this Singer 99K to sew everything from fairytale wedding dresses, delicate lingerie and couture-finished garments through to car seat covers and upholstery. The machine has been in mum's possession since I was a child; used to make plenty of curtains and running repairs. 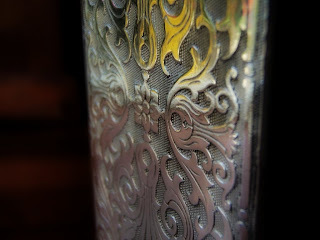 I have always loved the smell of the machine oil, the curiosity of the knee press and the prettiness of the gold decals. I hope I can continue to write her history. Oh wow! That is beautiful! So well kept for something so old and useful. This is beautiful, you're so lucky to have one of them! AND the site of that factory is about 10mins from where I live!! 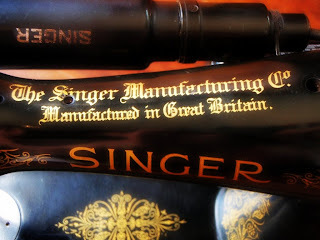 I have an old Singer too, mine was built in 1893 and is a hand-crank model. Sadly not a family heirloom, my Mum got it from a friend in the 70s. 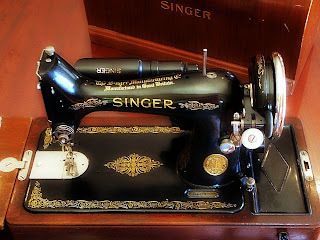 But I did first learn to sew on that machine and they are beautiful. I hope it enjoys many more generations of usefulness in your family. I thought you were going to say that you found it in the hard rubbish! How exciting to have a real family heirloom.... what a treasure indeed. She is gorgeous and an absolute treasure. The old stuff was made to last not like the stuff we get these days. 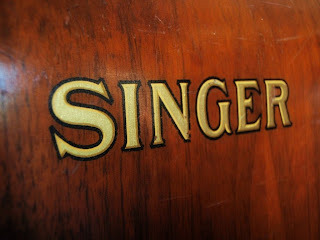 My Nan's old Singer is waiting patiently in my front entry way for the day when I get around to oiling it and using it. It still runs, just needs a little love! First I thought you were going to say you'd been extremely lucky with the hard rubbish search!! That's incredibly beautiful! It's so nice to have family heirlooms and to know their history. You're very lucky! Oh, you've made me come over quite sentimental teary. you lucky girl!!! Even if you told us you'd been looking for a machine like this to buy I'd be mighty impressed - but to now be the caretaker of this amazing piece of family history takes my breath away. I'm so very jealous!!! Oh god there is drool on my keyboard. I just bought one second hand online, it it currently being minded by my Aunt as the cross country freight charges were astronomical. Cannot wait to bring it home next time I am down there! You are so right Liesl - it is a true treasure. How wonderful to have such a beautiful machine AND to know its history AND that its history is part of your history. I didn't know you could look up the serial number, thanks for the tip, I just looked mine up, it's EE616866 so it was made in the same factory as yours but in 1948.